If you are worried about Crazy Donald Trump, I can name one more reason why you should worry about that nutjob. In addition to being endorsed by the KKK, various right-wing Christian groups, and chosen as the nominee of the Republican party... Donald Trump is also being endorsed by American preppers. Preppers, if you are not familiar with the term, are people who are preparing for a nuclear apocalypse. They buy prepper food, gadgets for the apocalypse, backyard bunkers, guns, ammo, etc. However there is a distinction here. Preppers are not just preparing for a POSSIBLE nuclear apocalypse, they actually WANT a nuclear apocalypse. 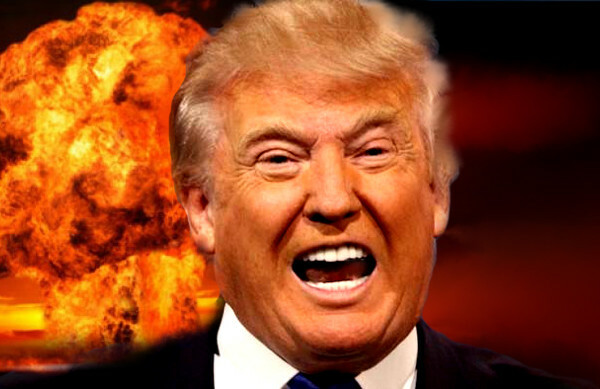 Preppers are hoping Donald Trump will nuke all the enemies of the USA, and that the USA gets nuked back. It is basically a giant mutual suicide pact on a worldwide scale. Now while I admit I like the whole idea of survivalism, hunting, gardening, living off the grid, building your own home, using solar/wind power, etc - myself and other survivalists and off-gridders have no interest in seeing such a catastrophe. After all, the whole point of surviving is living and increasing our chances of survival. Any kind of end of days style events, nuclear or supervirus or whatever, decreases our chances of survival. Our best chance for survival is peaceful coexistence. For off-gridders the whole point of living off the grid is to distance ourselves from the electrical grid. It doesn't mean we are in favour of a socioeconomic collapse of modern civilization. We still want modern society to keep on existing, along with the electricity grid, cellphone towers, the internet, etc. Living off the grid is more of a lifestyle choice, choosing to live in the woods, make your own electricity, grow/hunt/fish your own food, etc. It is about independence, not isolation. Preppers in the USA, on the other hand, are predominantly white people, Christians, and firm believers in the Book of Revelations (the chapter in the Bible about Doomsday). There is a distinct air of racism and religious bigotry about their beliefs, and they have embraced the idea of killing all their enemies with nuclear weapons and then bunkering down to wait out the results of a nuclear apocalypse. The biggest killers of people won't be the nuclear bombs themselves. It will be the collapse of society, the lack of hospitals, the lack of grocery stores with food, lack of sources of clean water that hasn't been contaminated by nuclear fallout, and so forth. Only the true survivalists, the people who were already living on the edges of civilization stand a real chance of surviving such horrific circumstances, as anyone even close to a fallout zone is basically doomed. Now you might think "Oh, but who would Donald Trump end up using nukes on?" Well he has already made that clear. Option 1. ISIL, which doesn't have nuclear weapons, but it will set a really bad standard if they are used. Option 2. Iran, which has the capability to make their own nuclear weaponss, but also has the option to purchase from North Korea. Option 3. North Korea, which is actively making long range nuclear missiles with the goal of making ones powerful enough to reach mainland USA. So far they can only reach Alaska and Hawaii. Option 4. Russia / Vladimir Putin. America's old Cold War nemesis. Option 5. China, to whom the USA owes trillions of dollars of national debt. Option 6. Any country that could potentially buy nukes from North Korea. Option 7. All of the above. The words coming out of Donald Trump's mouth indicate that he wants to keep nuclear weapons on the table. But they also indicate that he is freaking crazy. Trump was born and raised during the Cold War. He is a child of the age of nuclear proliferation. He lived through the Cuban Missile Crisis. Many past presidents also lived through these things, but they had more solid heads on their shoulders. Trump's lies, his delusions of grandeur, his lack of knowledge of American foreign policy, all of that means nothing compared to his religious fervor and desire to "Make America Great Again". Trump sees himself as the saviour of America. He has what some might call a Messiah Complex. But his ego is so fragile his normal routine when insulted is to sue people. So what happens when he cannot sue Putin? Or China? Or Mexico? What does a crazy religious nutjob do when he cannot sue someone, but he has access to nuclear weapons? Well it is pretty obvious. He decides to go out with a bang. Tack on the rumour that Donald Trump had an heart attack awhile back, and you have an old nutjob who is already dying who wants to go out with a bang. All he needs then is a second person to turn the key and enter their code to launch nukes. Enter Mike Pence. If you ever wanted a co-conspirator to help you kickstart a nuclear apocalypse, Mike Pence is the guy to pick. So yeah. To summarize Trump is scary. End of days scary.